People often stop juicing because of the hassle. A juicer that's difficult to clean, loud, too big, or that makes poor-quality juice will soon be relegated to the back of a cabinet. 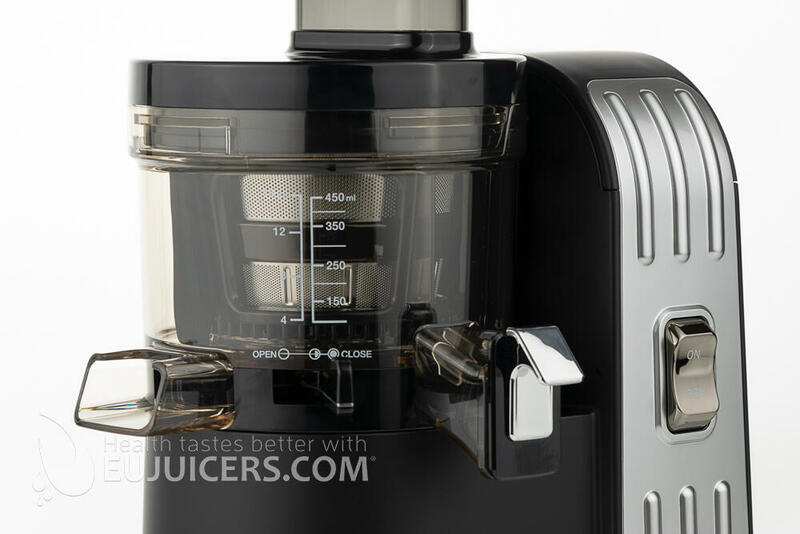 Sana's new EUJ-828 juicer has been designed from the ground up to avoid those problems and be the easiest juicer you've ever used. 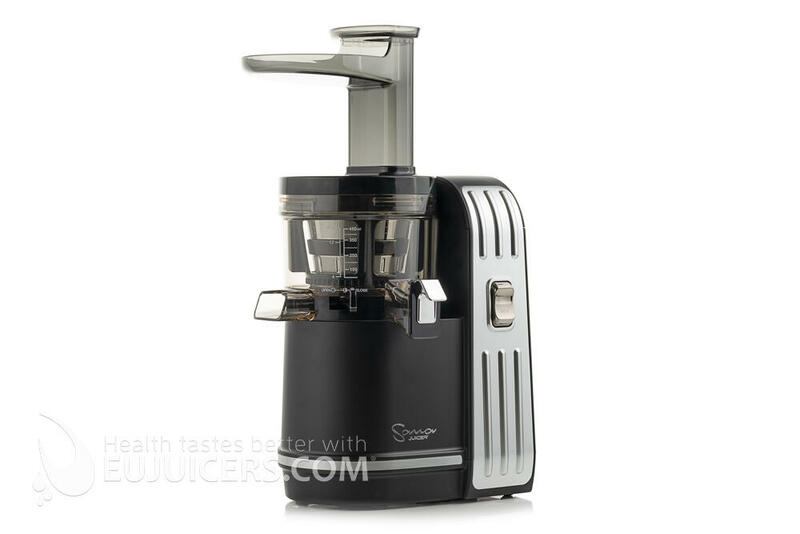 Quiet, compact, powerful, and simple to clean, the Sana 828 is the most advanced vertical juicer available. The juicing chamber in the Sana 828 has been redesigned to make it the most efficient and easy to use vertical juicer on the market. The pulp control lever lets you adjust the pressure in the juicing chamber, allowing higher yield with harder ingredients like carrots and easier cleaning with softer and stringy produce like pineapples. The new auger has been designed to simply be inserted in the juicing chamber without having to be lined up with the juicing screen. Four spinning blades operating at a low 17 rpm not only keep the screen clean during juicing, but also minimize any foaming in the juice. The pulp outlet chute has been made wider with a large opening in the top to make cleaning easier. Finally, the drive shaft is sealed in the juicing chamber, eliminating any possibility of juice leaking onto the motor base. The new dual hopper has been designed with convenience in mind. 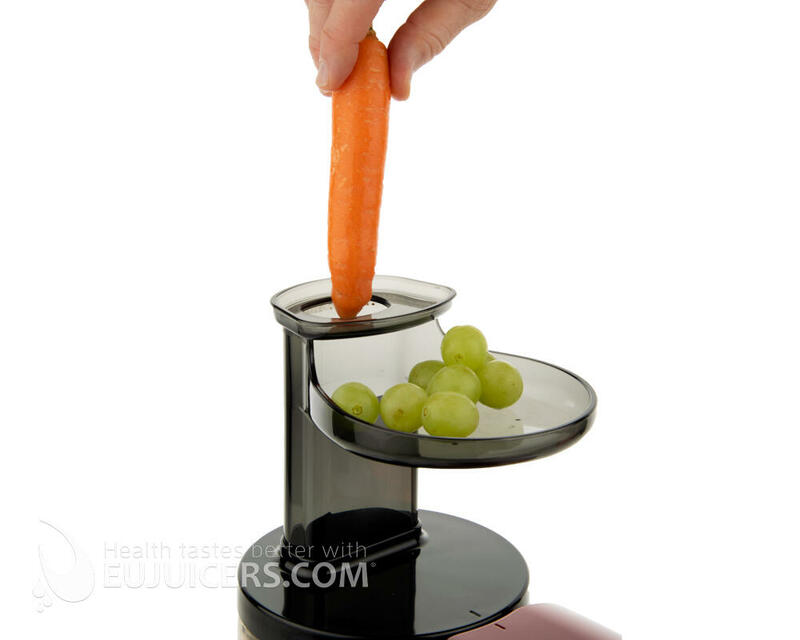 The top feed works great for most produce such as carrots, celery, apples, and more. The wide side slot has an integrated tray which is helpful for such things as leafy greens, berries, and cut vegetables. With dual magnetic safety sensors, the hopper can be mounted for right or left handed operation. 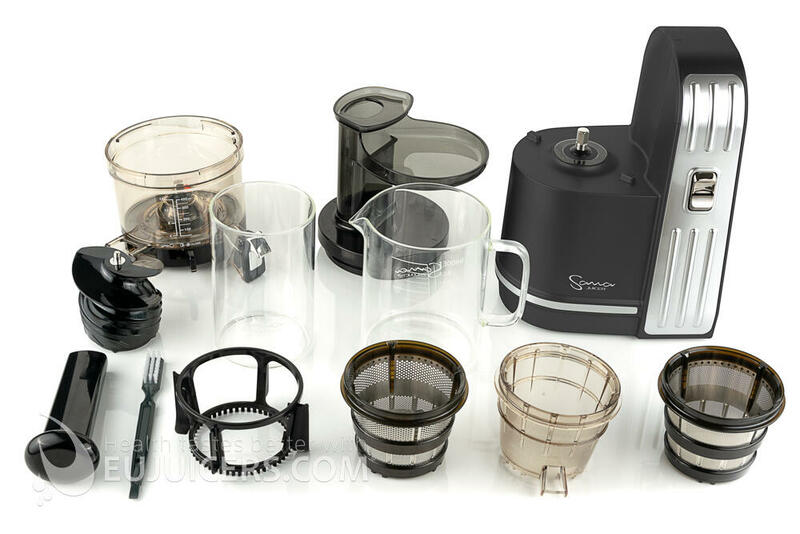 Most vertical juicers come only with one juicing screen. Sana's new 828 comes with three screens. The standard fine stainless steel screen is designed to get the maximum yield and clearest juice out of most produce. 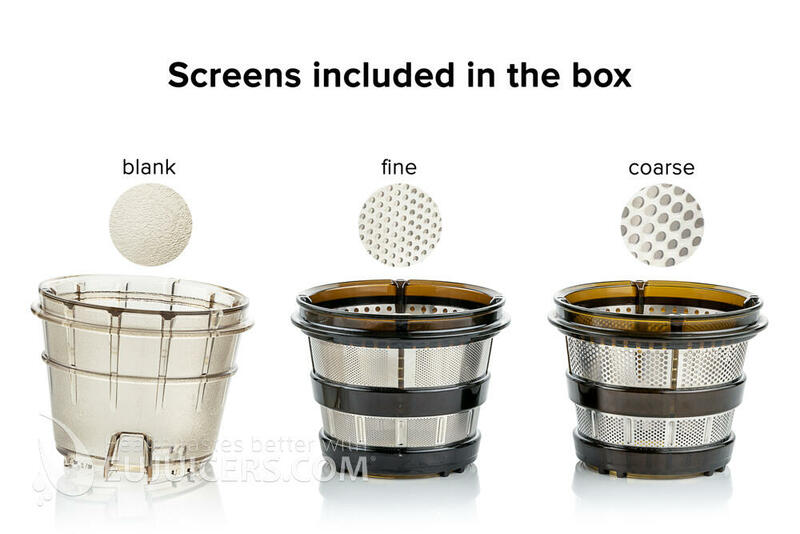 Also included is a coarse stainless steel juicing screen with larger holes which allow softer and fibrous produce like pineapple, firm peaches, and berries to be juiced - something most juicers can't handle. Finally, an ice cream screen is included for making frozen treats like fruit sorbets and banana-berry ice cream. The Sana 828 does a great job on all citrus. But if you want your orange juice fast without peeling, the optional citrus juicer attachment fits on the motor base to turn your Sana EUJ-828 into a powerful citrus juicer. Just cut any citrus in half and press it against the rotating auger - no peeling required. The juice pours out the flow spout right into your glass. Best of all, cleanup is simple - just rinse the attachment under running water. 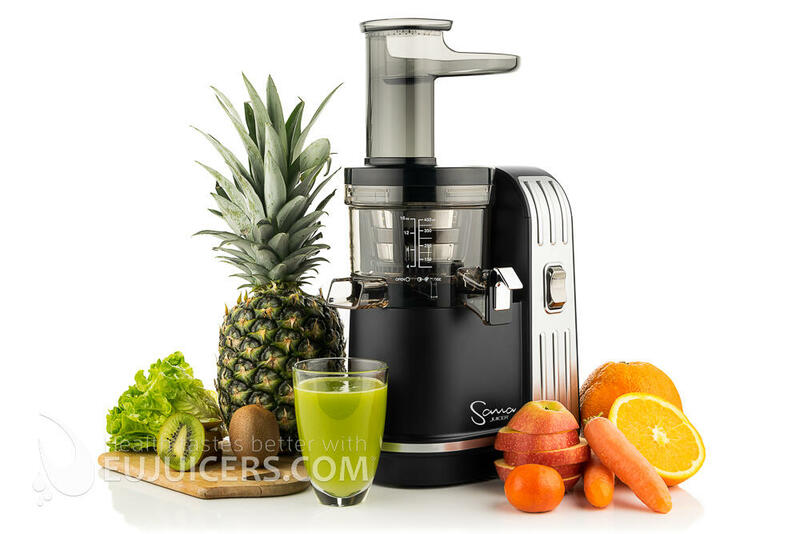 Manufactured from premium materials in a high-tech South Korean facility, the Sana 828 is designed to be the last juicer you’ll ever need. That's why we back it up with a lifetime service guarantee – all service work for the life of your Sana 828 is free of charge. If you have any problems with it after the 5/10 year warranty period is over, we will service it free of charge. You only pay for shipping to our service center and any parts needed. We will pay for the labor and shipping back to you. Just as they did with the 808, Sana again has a winner with the 828. The changes compared to the 808 are incremental but useful. We were a bit puzzled at first by the pulp control lever. Rather than being an analog pressure regulator like on the Sana 606 horizontal juicer, the 828's pulp control lever is designed to release pressure to make it easier to juice soft or fibrous fruit. 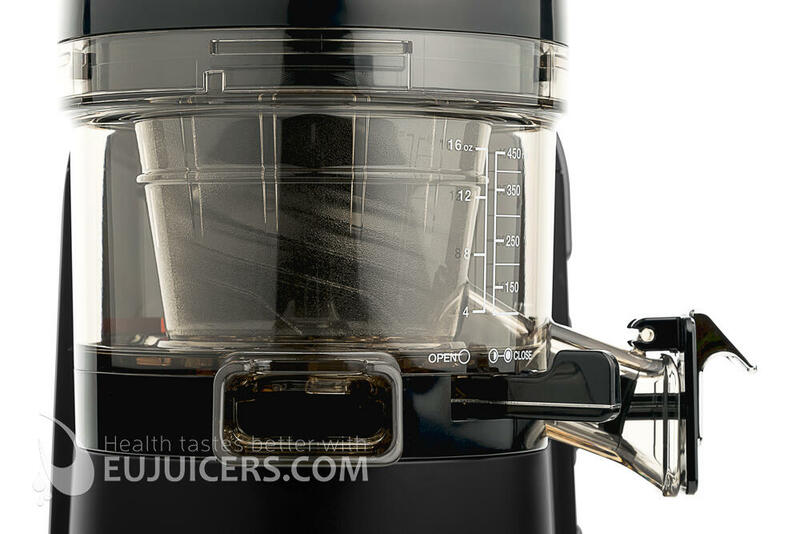 In practice, we found it useful toward the end of juicing to set it to the "half-open" position, as this pushed out more pulp and made it easier to clean. The dual hopper isn't as big as the wide mouth on the Kuvings or MMV. But since we generally cut produce into smaller pieces with verticals, it wasn't an issue. The side tray turned out to be especially useful for spinach, as we could slide a handful of spinach in sideways from the tray, and then push down from the top. This eliminated the usual problem of spinach leaves everywhere on the counter or in the juice. The sorbet screen is something not typically found in a vertical juicer. We've seen them as optional accessories on the Kuvings and Omega MMV, so it was nice to see it included here. This one is strictly designed for sorbets and banana-based "ice cream". We wouldn't recommend trying to make nut butter with it. In our tests, we found it performed similarly to the Sana 808, with just a bit higher yield. The consistency was very clear, with minimal pulp measured in our strainer. Surprisingly, we found the juice from the same carrots tasted noticeably sweeter in the 828 in a blind taste test. We're guessing that some tiny bits of sweet pulp remained in the juice - too fine to be noticeable in the texture of the juice. It handles carrots, spinach, apples, and pineapple with no problem. The pulp regulation lever was especially useful with the pineapple, as that tends to jam vertical juicers. The small improvements did make a difference in daily operation of the 828. We noticed that apple juice had less foam, most likely due to the low rotation speed of the cleaning blades. The motor was the quietest we have tested, noticeably quieter than even the Sana 808. Strangely, the crunching sound of carrots and squeaking sound of apples being processed was quieter as well, almost as if the juicing chamber is better insulated. 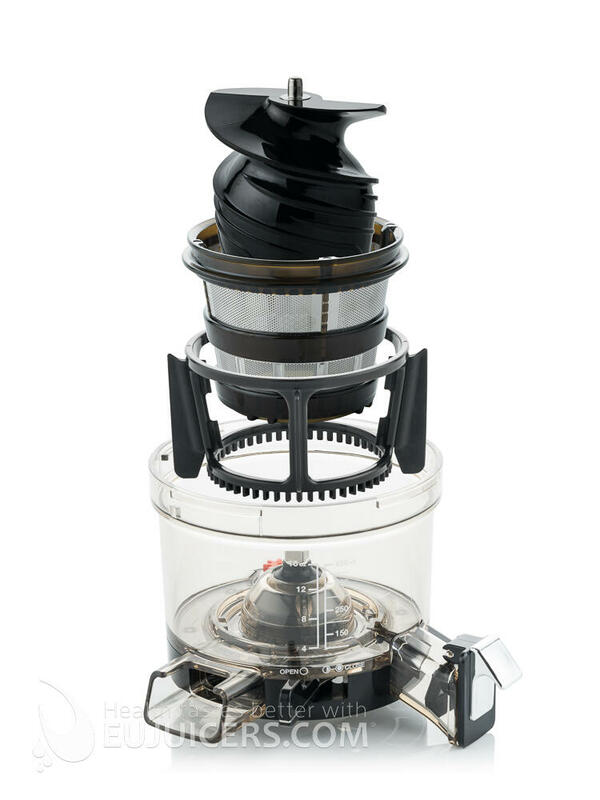 The wide pulp opening with the large notch taken out of the top made for faster cleaning, although the integrated pulp control lever meant that the rubber stopper under the juicing chamber couldn't be fully removed during cleaning. The glass juice pitcher was a nice feature. It's the first one we've seen with a vertical, which usually have smaller plastic pitchers which discolor over time (at least the BPA-free pitchers). The pulp container is also glass, which means you need to be careful about dropping it or banging it against a sink to get out the last bits of pulp. 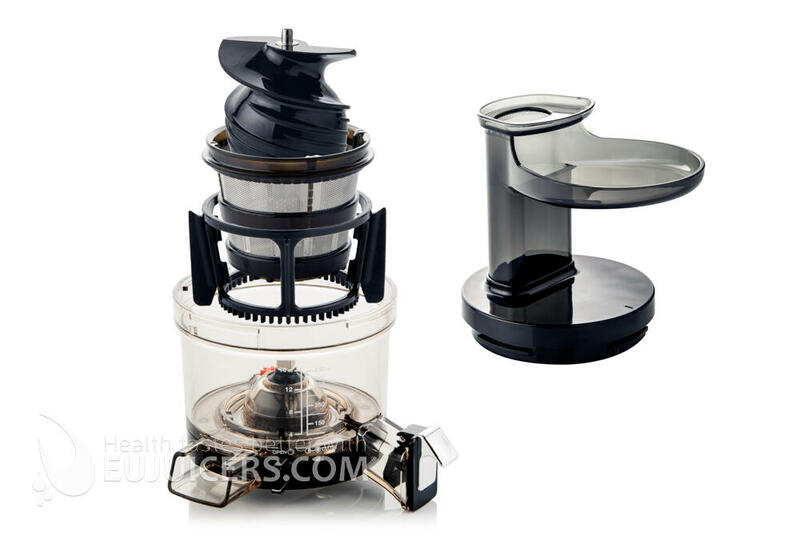 Looks are subjective, but we personally liked the design of the juicer. The large toggle switch for the juicer is high and up front, right where it should be. The build is solid as we've come to expect from Sana. Assembly and disassembly was fast, especially since the new auger doesn't need to fit into a notch in the juicing screen. Cleanup was similar to other premium juicers, although a bit quicker due to the wider pulp outlet. 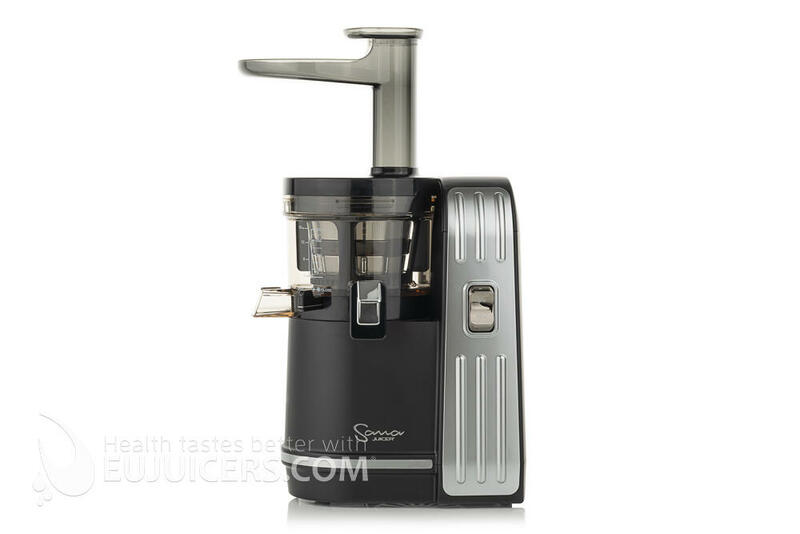 This is definitely in the top class of vertical juicers. In terms of alternatives, the Kuvings 9500 and similar Omega MMV have a more powerful motor and a wider feeding tube. They produce juice significantly faster, but produce pulpier juice. They also take longer to clean and are quite a bit louder. The Sana 808 remains a fine choice. 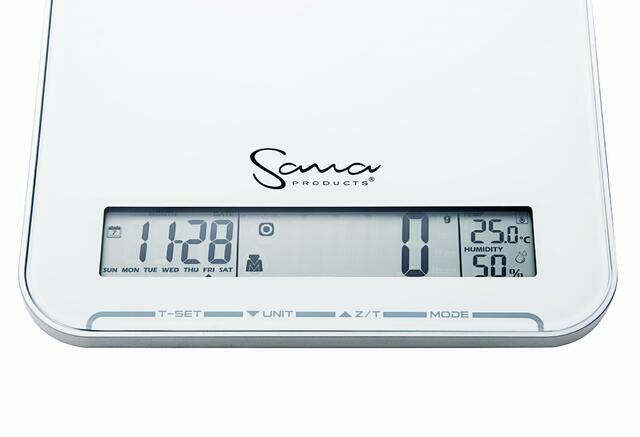 It is a little cheaper and performed similarly, but doesn't include the glass accessories or the sorbet screen, as well as some of the updated features. 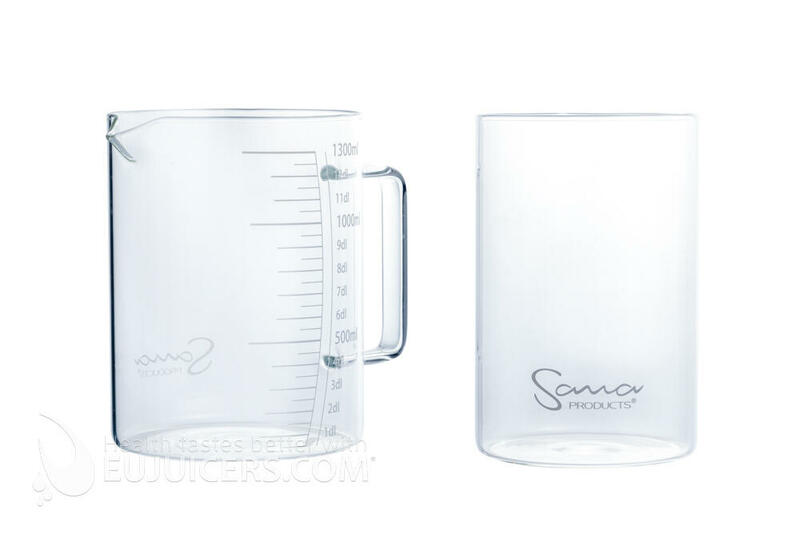 Container set (pulp and juice) for Sana Juicer EUJ-828. Auger for Sana Juicer EUJ-828. Drum for Sana Juicer EUJ-828. Drum base for Sana Juicer EUJ-828. Ice cream maker for Sana Juicer EUJ-828. Coarse screen for Sana Juicer EUJ-828. Fine screen for Sana Juicer EUJ-828. Hopper for Sana Juicer EUJ-828. 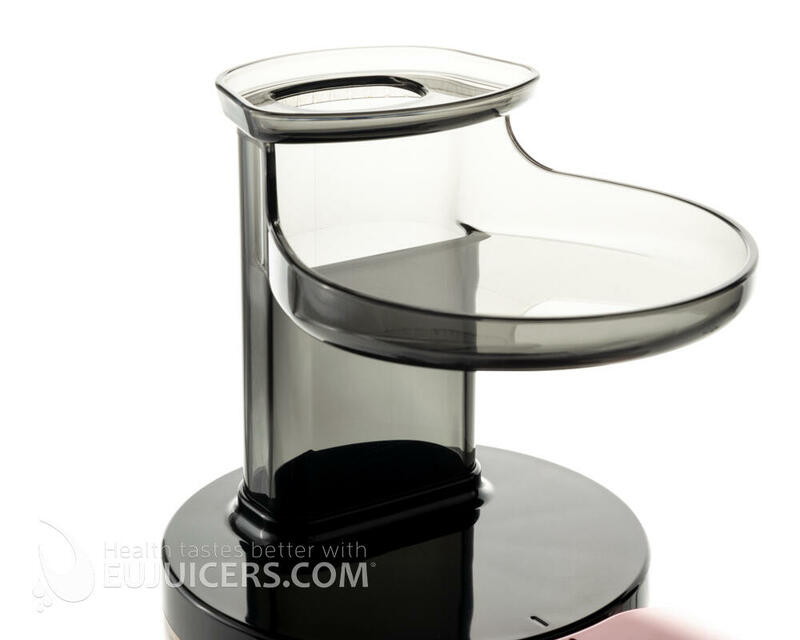 Brush holder for Sana Juicer EUJ-828. Silicone blades for Sana Juicer EUJ-828. Juice flap seal for Sana Juicer EUJ-828. Juice flap without seal for Sana Juicer EUJ-828. Pulp flap for Sana Juicer EUJ-828. Pusher for Sana Juicer EUJ-828. Cleaning brush for Sana Juicer EUJ-828. Body shaft seal for Sana Juicer EUJ-828. Drum shaft seal for Sana Juicer EUJ-828. 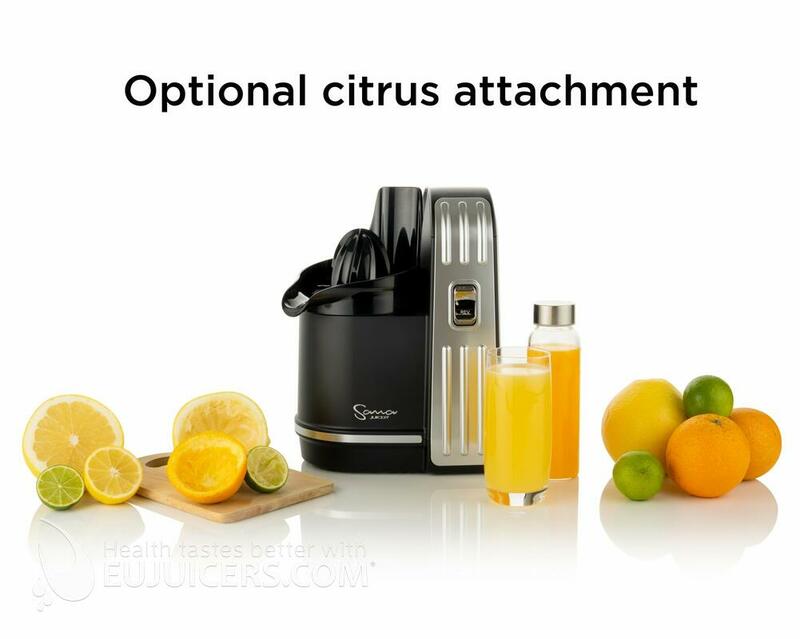 This attachment turns the Sana EUJ-828 juicer into a quick citrus juicer. This allows you to juice oranges, lemons, limes, grapefruit and other citrus without peeling the fruit. It is a quick way to get your morning orange juice fast - just juice and rinse.